As a day of mourning, study of religion is strictly prohibited – because it is said that study of Torah brings joy. But, in fact, there is a beautiful liturgy that day – the Kinnos (lamentations) – incredibly beautiful and tragic poems of lamentation. In many communities, this is supplemented by the book of Lamentations (one of the most beautiful, albeit tragic, books in the Hebrew Bible) and among some Sephardic Jewish groups, the book of Job (widely considered to be the most literary book in the Hebrew Bible.) Some groups have extensive study groups on the Kinnos – and since the holiday is considered to be “post-biblical” (e.g., not taught in the five books of Moses), one can find many of these lectures streamed online. This paragraph in particular got me thinking of the “post-biblical” Psalm which we find numbered in the Hebrew Bible today as Psalm 78. The Psalm is identified at the start as a משכיל, a “maskil,” of which scholar / translator Robert Alter says: “This is clearly a category of song, but its precise nature remains unknown.” Alter takes readers to Amos 5:13 to say that a maskil “would appear to be a joyous song, though not all the occurrences in Psalms substantiate that connotation.” He notes, for example, Psalm 32, where “there may be a punning reference to a homonym that means ‘discerning person’ or ‘giver of instruction'” and where the “word translated as ‘let me teach you’ in verse 8 employes the same root.” (See page 110 of Alter’s translation of the Psalms.) I wonder how much joy is evoked – or was ever meant to be brought out – by studying Psalm 78. What is very interesting about Psalm 78 is that more clearly it would seem to be a hearkening to and a real study of תורה, or Torah. 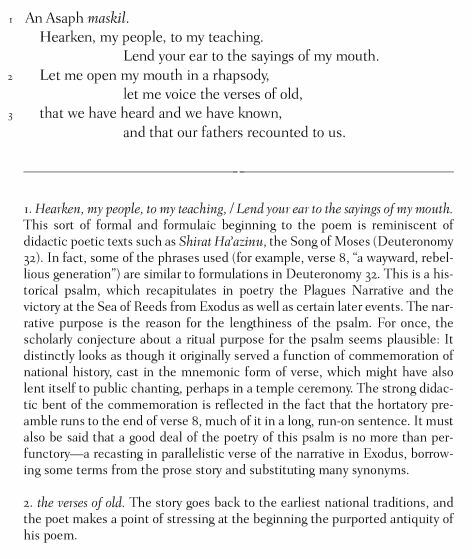 The clear allusions to Exodus and Deuteronomy in the Psalm and in Alter’s footnote make rather obvious that the “teaching” in verse 1, right at the start, is “Torah.” Verse 30 of Psalm 78 bases its language on Numbers 11, verses 20 and 33, says Alter. And verse 13 of the Psalm, Alter observes, “is a direct quotation [of the Hebrew] from the Song of the Sea, Exodus 15:8.” So more than just a study of Torah, this Psalm seems to be a study of the Hebrew language of Torah and a bit post-Biblical borrowing of Torah. But I want to move forward and elsewhere. I’d like us to see some of the interpretive spins in this Psalm and around 250 BCE. According to some legend, the Jews living in Alexandria, the namesake city of Alexander the Great, were translating the scriptures into Greek. This translation had been commissioned by the monarch of Egypt, right there in Egypt. Now, the legend says that Torah was translated into Greek in Alexandria, Egypt by a very specific number of some of the Jews there. Perhaps the post-Torah literature of what we know today as the Hebrew Bible was also so translated. Perhaps some of that was this Psalm, Psalm 78. What is interesting about this Psalm in particular (now numbered in the Greek translation, the Septuagint version, as Psalm 77) is how it in multiple verses references and names and recalls Egypt. The Greek translation of these references in Hebrew is not so interesting, nonetheless. 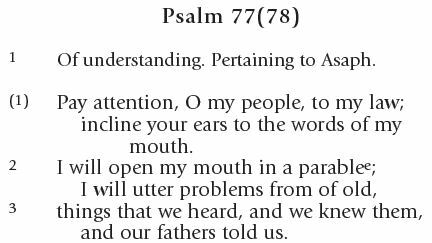 As NETS Septuagint translator and scholar Albert Pietersma put it, the Psalms rendered into Greek are very typically and predictably “heavily circumscribed linguistic interlinearity.” No where is this more apparent than in the verses in Psalm 77(78) that mention Egypt. There’s no mistaking what the Psalm is saying about Egypt whether in Hebrew or in Greek. And yet, the Psalm starts of somewhat differently in Greek than it does in Hebrew. From the beginning, the reader, especially the bi-lingual insiders who get both language, understand the interpretive spin. Pietersma has acknowledged these spins and what he calls “literary sparks” as translator deviations from the norm of “heavily circumscribed linguistic interlinearity.” Nonetheless, his English translation of the Greek translation of the Hebrew sometimes does not so well highlight the “spin” or the “spark.” Again, I think the Greek translation of what Alter calls “the hortatory preamble” of this Psalm 78 is a somewhat different start to the Psalm than what we read in the Hebrew poetic original. So let’s take a look at how Pietersma translates the Greek in English, but let’s look a bit more at the Greek to see what might be going on for the bi-lingual translators and readers in Egypt. We could easily read the first phrase as a reference to Torah. The Jewish readers of this Hebraic Hellene would get this, and yet to call Torah “nomos” takes the idea of “instruction” more firmly into the overdetermined Greek notions and disputes about legalities and law. Greek readers in Egypt who had less of an understanding of Torah, of the Hebrew scriptures, would not so much associate the start of this Psalm with “teaching” as they would with politics in the context of imperial Egyptian-royal pan-Hellenism. The third Greek phrase above might be translated as follows: “I’ll sing songs as Problems from the Beginning.” What I want to emphasize is something Pietersma notices: the Septuagint translators were not Greek “hacks.” There’s good evidence that they knew Greek literature. We could argue how well they knew Aristotle, if they knew his works at all. But even if the translators didn’t have access to any of Aristotle’s writings, the forceful conquest of the learned Alexander would very likely have sent Greek imperial educational shockwaves through all the world, especially into this cosmopolitan Polis where the translation was under way. “Problems” were something that Aristotle and that Alexander were studied in. For example, in his Politics, Aristotle specifically and explicitly writes of the universal problems of forms of constitutions in democracies. Around 1284a and 1284b, Aristotle addresses “the universal problem” (τὸ πρόβλημα καθόλου) of this form of politics, with illustrations from the fable of Antisthenes in which “the hares made speeches in the assembly and demanded that all should have equality” especially with “the lions”; and with illustrations from the mythologies of the Argonauts; but much more so with real solid historical illustrations from “the Athenians” in dealings with “the Samians and Chians and Lesbians” and with real solid historical illustrations from “the king of the Persians” who had to deal with “the Medes and Babylonians and the other races that had waxed proud.” And, in the Aristotle corpus, there is what is commonly understood as a pseudo Arisotelian treatise called Problems. This points to a Greek literary tradition of theorizing προβλήματα, and for Jewish translators of Hebrew who were not hacks with Hellene to use this phrase at the beginning of this Psalm is rather fascinating. The start of this now-Greek Psalm takes readers back to the problems at the Beginning, at the start of Torah, to the ἀρχῆς. There, there’s not only the opener “ἐν ἀρχῇ ἐποίησεν ὁ θεὸς τὸν οὐρανὸν καὶ τὴν γῆν” (Genesis 1:1 in Greek); but there’s also the ambiguity of the phrase ἀρχῆς as a prince, or a ruler, or a regular, as it appears in the same context as “καὶ ἐποίησεν ὁ θεὸς τοὺς δύο φωστῆρας τοὺς μεγάλους τὸν φωστῆρα τὸν μέγαν εἰς ἀρχὰς τῆς ἡμέρας καὶ τὸν φωστῆρα τὸν ἐλάσσω εἰς ἀρχὰς τῆς νυκτός καὶ τοὺς ἀστέρας” (Genesis 1:16 in Greek). What I’m hoping we’ll see is the richness of this third Greek phrase at the beginning of the translated Psalm. In monolingual Greek, there’s quite a set of meanings. But to bilingual Greek-Hebrew readers, the Greek reads as an insider Jewish translation, one that suggests that Torah study addresses problems in very creative ways. Instruction and parable create quite a different spin from law and problems. Rhapsody likewise gives no suggestion of parable, or is it ‘rule’ (mashal) for problem ‘solving’. Problematic I think. As to voicing verses – it is nice alliteration. What about ‘fermenting riddles’ since riddle is parallel to parable? This psalm as a whole is a focused parable ultimately favouring Judah over Israel. Yet even with that ‘spin’, do you think that this psalm can justify the application of the history of Israel as parable to self or to social history, such an application including slavery, escape, complaint, provocation, exile and restoration, and even the unresolved tension of diaspora, a condition that is common to many peoples? I agree with you that Alter’s alliteration is “nice” (maybe echoing such in אביעה חידות); but his English translation from the Hebrew is, in general, much better than the KJV and the others. The phrase חידה takes listeners and readers back to the voicing of the verses of old — and there’s only one use of this phrase in Torah, in Numbers 12, where there’s the telling of how Moses gets the word from God. “Rhapsody” is very Greeky, like “parable,” but at least it suggests something more epic, more historical, in Torah, in the Psalm as its parallel. “Parable” has much more of a “Once upon a time” and a “So the moral to this story” feel to it. This last sentence of mine in my previous paragraph, then, is my answer to your second question. But to go on, I do think the LXX translators are using their Greek here in a way that the readers of only Greek (and not also of Hebrew) will hear the Psalm as a kind of outsider didactic warning against coming politically and/or militarily against the people of the Hebrew God. Insiders to the text, however, get much more — they do read παραβολαῖς as also more a ῥαψῳδός. The title of the second of Moses’s five books, in Greek translation, renders this treatise of Torah more as a ῥαψῳδός; of course, it’s ἔξ·οδος. Some time ago, at another blog of mine, I mused about how Moses may have been the Odysseus of Torah if the LXX makes an Odus.sey of the Ex.Odus. The carrying over of the Pentateuch into Greek, even with a title like Genesis, makes it sound like Aristotle’s Generations and Hesiod’s TheoGony and so forth. The Hellene wordplay in the Psalms, as Greek translations, is indeed a set of literary sparks and interpretative spins. The bilingual readers get both sides of what’s going on with that, the interlation or stereopoetry that Mikhail Epstein much later theorizes.